A show of hands of those of us who aren’t really the least bit intrigued by yet another production of Our Town. Look closely and you will see my hand frantically waving in the back. This Thorton Wilder gem has been staged by well meaning community theatres, eager High School English teachers, a few edgy prison program directors and even a 1980s sitcom. We all know it backward and forward, and have ceased to see the delicacy of Wilder’s work. Have I got the remedy for you. The Barrow Street Theatre has brought the Hypocrites (Chicago) production, with full cast, to New York. 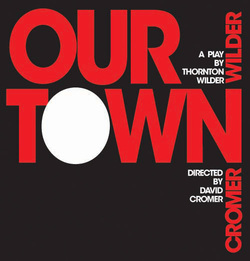 David Cromer (upcoming Brighton Beach Memoirs and Broadway Bound) directs this fresh and modern interpret ation of the 1938 Our Town. Cromer, not only brings a clean and engrossing production to the stage, he also manages it. He is most brilliant in the role of the stage manager. While the cast is engaging and quite talented, it is the staging that is the star of this production. Set on a thrust stage (which is actually just the floor of the center of the room) the audience is surrounding (and sometimes IN) the action on three sides. Cromer keeps the houselights up the entire time, dimming them slightly in the third act. This device is not nearly as distracting as one would think. Even with Judd Hirsch sitting directly across from me, my attention was focused on the Our Town actors. This was partly due to the fabulous use of space. The choir congregates and sings on a wide fly above the stage. This gives the audience a new place to focus from time to time. Actors use the thrust floor space as if it is an actual town square. Actors weave in and out of the audience in the most naturalistic of manner. There is nothing self conscious or contrived about the device. The stage manager’s affect and use of cell phone, combined with the modern day dress of the cast, gives the whole production a sense of the present. While undoubtedly set in the thirties (evident by milk delivered by horse) there was only a sense of modern day small town throughout the production. Three acts can seem daunting to the average theatre goer, but the evening simply flew by. This is a production not to be missed. It will make you think differently about this American classic and will leave you with a sense of wonder about the experience of true creativity. Mr. Cromer is someone to watch.